Caption slip reads: "Photographer: Gaze. Date: 1958-02-28. Reporter: Gaze. Assignment: Diane Baker- Film contract. Special instructions: For Monday, 3rd. 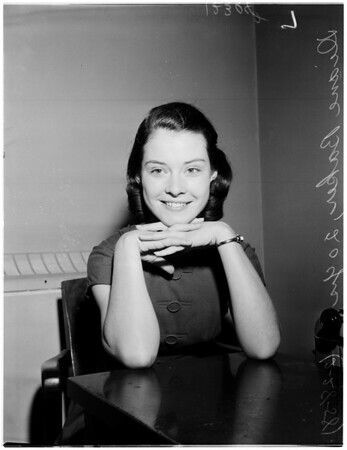 7/8/9: Diane Baker, 20, who today had won approval of a 7-year film contract with 20th Century Fox Studio. Santa Monica Superior Judge Orlando H. Rhodes approved contract, calling for a salary ranging from $250 weekly for the first year to $1250, with the provision that Daine invest 15% if her earnings in United States Savings Bonds. 52/53: Former actress Dorothy Harrington Baker (left) gives her daughter, Diane, 20, a congratulatory hug following Superior Court approval of seven-year contract between the young actress and 20th Century Fox Studio. Diane must invest 15% of her salary, ranging from $250 to $1250 weekly, in United States Savings Bonds, the court decried".